Building the Future of SD89! In District 89 we believe in continuous improvement. We frequently review our current practices, procedures and policies to ensure that we provide the best learning outcomes for students. 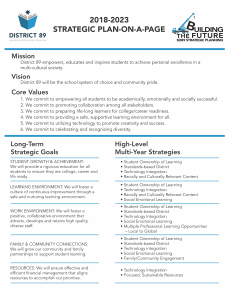 During the 2017-2018 academic year our district went through the process of developing a new strategic plan for the district. Click on the tabs above to view the process and the final Strategic Plan.